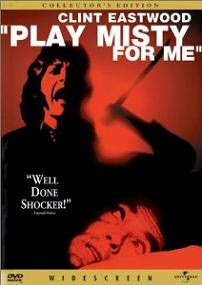 Play Misty for Me is Clint Eastwood's directorial debut released in the distant 1971. He has embarked on various directions making all kinds of films for the next 40 years but rarely his movies have been so suspenseful as his first effort. This does not necessarily mean that Play Misty for Me is his best film (in fact, it exposes enough shortcomings) but on the thrilling side, the movie has a lot to offer (especially for an early 70s film). The story revolves around disc jockey Dave (Clint Eastwood), a demented female fan of his (Jessica Walter) and the consequences of their brief affair and Evelyn's obsession when Dave's ex-girlfriend Tobie (Donna Mills) comes back into the picture. It has appeared earlier that Evelyn phones to the radio station every night asking Dave to play Erroll Garner's song "Misty" but this is the nicest of her doings. She spoils Dave's business appointment, penetrates into his house, offends his housemaid and makes his life terrible. As Dave's current love interest, Tobie is in danger even more. The movie offers plenty of suspense and most of the time throughout its second half you would look forward for something (bad) to happen. The acting contributes a lot to the overall tension. Jessica Walter is a brilliant psycho that makes you constantly wonder what to expect next when she's on the screen and even more when she's not. She looks harmless and in the next moment violent. Her unstableness only intensifies the terror. Clint Eastwood makes one of his strong performances and his self-confidence fits well the movie and its threatening atmosphere. Donna Mills is fragile and unsuspecting, almost self-attracting troubles. The rest of the cast is Ok with director Don Siegel deserving mentioning primarily because of his peculiar game with Eastwood's character. Now for the worse part. While Play Misty for Me offers enough of suspense, it's not so scary as many of the movies released in the years following it. The narrative and most of the events are predictable and there are almost no surprises. This perception however could be referred to the genre's oversaturation nowadays. Another weakness is the Semi-Obligatory Lyrical Interlude (the name comes from Roger Ebert) when Dave and Tobie walk for a couple of minutes under the tunes of a hit song. Although the scene is nice to watch and shares the dark tones of the movie, the whole sequence is just too long and boring. Another unnecessary scene is the festival one. I can't find its purpose and probably the only thing it helps for is to make you wondering whether something wrong is going to happen during it. Finally, we have a police officer behaving unprofessionally and apparently marching towards his demise with ease. Despite its flaws Play Misty for Me is a solid debut effort for Clint Eastwood. Although it has probably not aged quite well, the movie has offered a good thrilling story at the time and efficient performances. It's a film that a lover of the genre will enjoy and it drops a hint of Eastwood's directorial potential which we have been able to witness for decades.